ROHNERT PARK, Calif. -- Rohnert Park officials said an independent investigation has concluded that a city public safety officer acted reasonably when he drew his weapon during an encounter with a citizen in July. In response, Jarin Beck, the attorney for the citizen, Don McComas, said he will file a claim for administrative remedy against the city as a prelude to filing a civil lawsuit. "They have 45 days to respond, and if the claim is rejected, we will file a civil suit in Sonoma County or in federal court in San Francisco," Beck said. 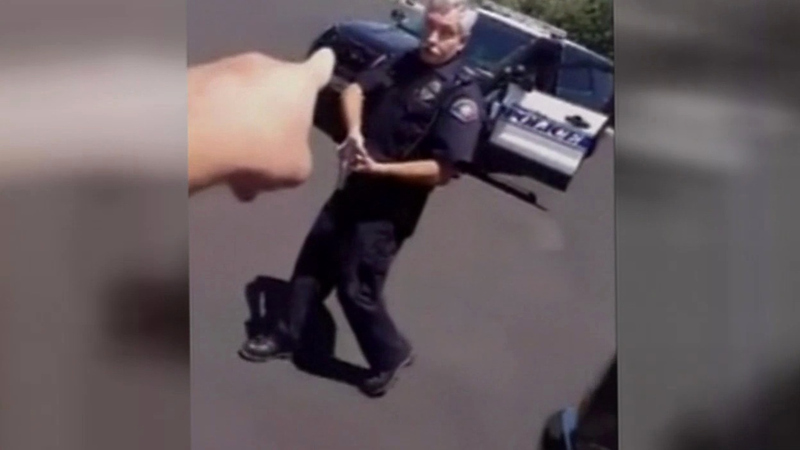 McComas videotaped the July 29 encounter with Rohnert Park Department of Public Safety Officer David Rodriguez when the officer stopped in front of his home on Hermitage Way as he stood by his truck and boat trailer. During the five-minute video of the encounter, McComas objects to Rodriguez observing him from his patrol car, getting out of the car, ordering McComas to take his hand out of his pocket and the officer taking his weapon out of its holster. McComas tells Rodriguez he has done nothing wrong, tells him to go away and accuses police of being corrupt. "Are you some kind of constitutionalist crazy guy?" Rodriguez asks at one point before leaving. McComas posted the video on Facebook, where it drew heated reactions from social media users. In a news release Wednesday, the city of Rohnert Park said it commissioned an independent third-party investigator, Sue Ann Van Dermyden, to investigate the incident. The city said Van Dermyden is a licensed attorney and private investigator with experience in internal investigations involving public safety officers. The city said she consulted with and relied upon input from Ed McErlain, a retired law enforcement officer with 32 years of experience. The investigation determined Rodriguez "reasonably exercised his right to stop and have contact with the resident and did so for legitimate reasons and not for the purpose of harassing or mistreating the resident," the city said. "It was reasonable for the officer to un-holster his duty weapon at the point he did during the encounter with the resident," the city said. The city said Rodriguez was investigating complaints about parking code violations and he was checking a vehicle's registration when he saw McComas standing on the sidewalk by a truck. "The officer saw the resident quickly duck behind the truck after his patrol car came into view. The officer considered this suspicious behavior, and decided to investigate further," the city said. "After the officer got out of his patrol car, he also noticed other unusual behavior, including the resident's agitated demeanor and his initial refusal to comply with the officer's instruction to remove his hand from his pocket, which had a bulge in it," the city said. Rohnert Park public safety officers rotate between the police and fire divisions, and Rodriguez requested in early July before the incident occurred that he be assigned to the Fire Division, the city said. The city said McComas initially agreed to be interviewed through his attorney as part of the investigation, bur the attorney canceled the interview and declined further requests to interview McComas. "The investigation, however, closely examined all aspects of the video tape of the encounter and also reviewed the resident's social media postings in order to attempt to understand his version of the events," the city said. The city said it has confidence in the Department of Public Safety and receives positive public comments on its officers' behavior. "In this incident, we recognize that there is the opportunity for improvements in some areas. The city is committed to continuing its efforts to strengthen the positive relationship between the Department of Public Safety and the Rohnert Park community," the city said. Beck, McComas' attorney, said he is not surprised by the results of the investigation. "I don't think when you are paid by the people you are investigating that you can be unbiased. That law firm is used quite often for these situations," Beck said.